Old people get a bad rap for eating early. Younger people flaunt their late eating habits as though they’ve made it into some exclusive club, the club that only eats late. Dinner reservations for me and my cool young friends at 8 pm, please. But throughout this year of fried fish dinners, I’ve found that old people don’t deserve this bad rap. There’s nothing wrong with eating early. In fact, I’ve been eating most of my fishy meals around 5 pm. Why? Because I don’t want to wait in line. The old people don’t want to wait either, that’s why they head out early. And that’s why I cozied up to a garden-view table at Crandall’s last Friday at 5 pm on the nose. This review wasn’t easy for me. I’ve long known of Crandall’s, but I hadn’t yet been. As I defend and flaunt all things Wisconsin, Crandall’s is on the other side of that skinny border. It might be two short miles from Wisconsin, but it’s technically in Hebron, Illinois. There’s nothing wrong with that of course, and we’ll begrudgingly allow our Illinoisan brethren to adopt our culture. I went there Friday night to determine whether or not they’re doing a proper job representing the Friday Fish Fry, which is, unequivocally, our thing. 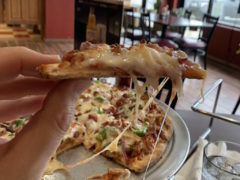 I should note that my dinner at Crandall’s was covered by a gracious client of mine who had told me often of this regionally famous institution. I was grateful for his invitation, and grateful for his wise guidance that led us to a four top table with a view of the pleasant gardens that Crandall’s has cultivated. Something to be sure of, Crandall’s is not a Fish Fry Joint. It’s a Chicken Joint. The website isn’t CRANDALLSFISH.COM. It’s CRANDALLSCHICKEN.COM. 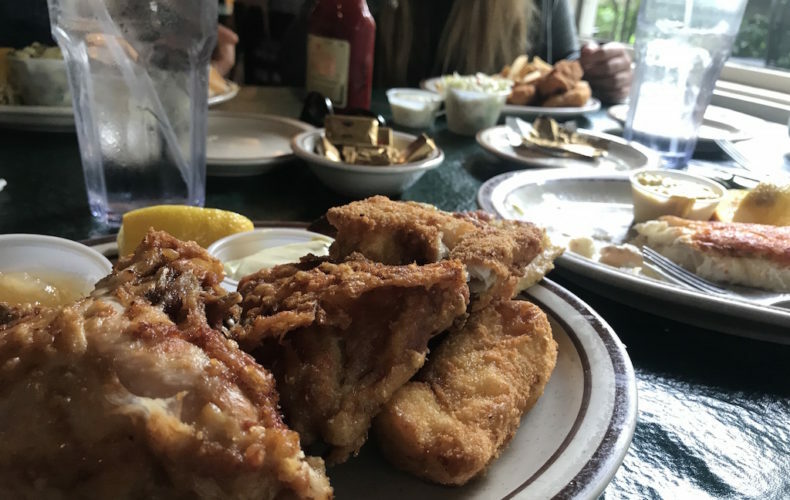 Even though the lake set knows Crandall’s predominately for its place in our fish fry realm, it’s a chicken shop first and a fish shop second. Still, the waitress was table side and told us of the special. Fried Icelandic Cod is all you can eat. Broiled cod is single serve. If your obesity is uncontrolled, you can order the combo platter which is chicken and fish. And if you’re me, you order the combo platter AND a side of the broiled cod, just to be sure. The orders were placed and the waitress promptly brought out a basket of fresh, warm bread and cinnamon rolls. The butter was forced into a tablespoon rectangle and held captive by foil, but it was softened, so things weren’t all bad. The dinner rolls and cinnamon rolls were both light and airy, and both quickly disappeared from our table. Our waitress removed the empty basket and we felt deep shame over our gluttony. The fish was brought out soon enough, as the restaurant slowly filled with Friday diners of all makes and models. Some old farmers from down the road, some families from town. I recognized several diners from the Lake Geneva scene. Everyone was happy. A heaping plate of chicken and cod and potato pancakes was placed before me, a towering tribute to fried flesh. My large piece of broiled was on its own plate, served with some lemon slices. 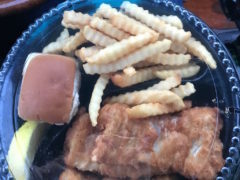 I ate first from the cuts of fried cod. They were flour dredged and fried, not battered. The fish was a slight touch dry, but the seasoning in the dredge was pronounced, which was a good thing. The theme of proper seasoning would run throughout the night. The baked cod had a nice texture and was properly salted, but it, too, was just a touch dry. I realized I was judging this place more harshly than it might have deserved, but this place is royalty in the fish fry world and I felt I had to hold it to that standard. The potato pancakes were crisp and moist and well salted. Maybe a bit too salted, if there is such a thing. While I was there for the fish, I ate a piece of chicken and quickly realized why the website proclaims the chicken to be world famous. It was tender and nicely salted, the thin seasoned dredge impossibly crispy. The chicken was divine. As quickly as it started, dinner was over. I was stuffed. 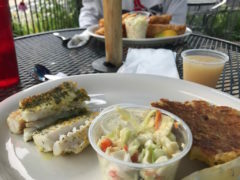 The dinner was a success, and it wasn’t difficult to see why Crandall’s holds captive the attention of the thousands of patrons who frequent this roadside restaurant. While I’ve only been once, I had a distinct feeling that Crandall’s doesn’t waiver much from week to week, dinner to dinner. It has the air of consistency, much like Anthony’s, and that’s what keeps that till humming. The staff was pleasant and courteous, the space clean and inviting, the parking lot oversized and accommodating. Unlike other restaurants in this series, I don’t think you need me to tell you to go to Crandall’s. If you already know, you already go, and chances are you’ll be there next Friday just like you were the Friday before. Abbey springs is still the best in the Lake G area. On balance, I don’t disagree. But if you look back a week you’ll see I recently had a very mediocre fish fry there. Consistency is difficult for this area to master.